Although soybean oil doesn’t get as much press as coconut or olive oil, it’s more widely consumed than one might think.1 Consumers may not realize that when they purchase a bottle of “100% vegetable oil,” it’s actually soybean oil. But if soybean oil’s role in American diets has gone largely unrecognized, that may be about to change. The spotlight might be shinning on soybean oil a lot more in the months ahead, however, as a result of three developments. Soybean oil played a major role in all four clinical trials highlighted by the American Heart Association (AHA) in its recent report on dietary fat and cardiovascular disease (CVD).2 The AHA presidential advisory strongly recommended that dietary fat should be replaced with omega-6 polyunsaturated fats to reduce CVD risk. Soybean oil is particularly rich in this type of fat. In addition, the Food and Drug Administration (FDA) recently awarded a qualified health claim for soybean oil and heart disease, noting that a daily intake of approximately 1½ tablespoons of soybean oil as a replacement for sources of saturated fat in the diet, could reduce the risk of coronary heart disease. 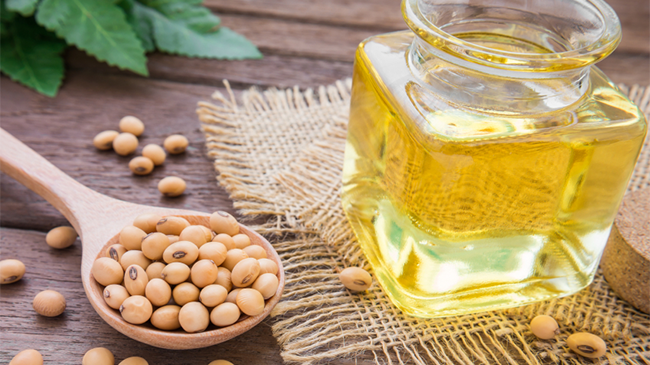 The decision was based on four intervention studies demonstrating the cholesterol-lowering effects of soybean oil and one case-control study showing soybean oil intake was associated with a reduced risk of developing an acute myocardial infarction. Products that contain at least five grams of soybean oil per serving qualify for the claim. Finally, of particular interest to food service providers, a new product called high oleic soybean oil (HOSO) is becoming more commercially available. Although still a liquid oil, HOSO has a longer shelf- and fry-life than conventional soybean oil. Blending HOSO with other oils may also create products with increased functionality for a greater variety of food applications. While soybean oil has been a staple in American kitchens and in food service for decades, the growing recognition of its benefits may finally focus the spotlight on this healthful source of dietary fats. Blasbalg TL, Hibbeln JR, Ramsden CE, Majchrzak SF, Rawlings RR. Changes in consumption of omega-3 and omega-6 fatty acids in the United States during the 20th century. Am J Clin Nutr. 2011;93:950-62. Sacks FM, Lichtenstein AH, Wu JHY, et al. Dietary fats and cardiovascular disease: A presidential advisory from the American Heart Association. Circulation. 2017. The new high oleic soybean is most commonly genetically modified, though there are varieties that have been produced through breeding.